Teeth are highly specialized things. They provide shape to our faces, help us form sounds when we speak and help us to bite into and chew our food. Most importantly, teeth give us our wonderful 'pearly white' smiles. Our Lorne Park Dental team wants you to know all about teeth. Let's start by looking at tooth development. The reference charts below will give you a general idea of when that happens. 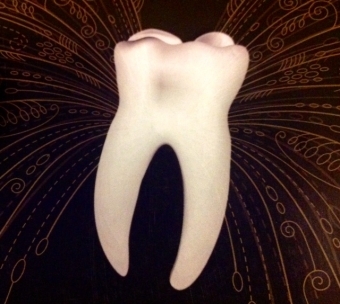 Keep in mind that the timing of tooth development can vary from person to person. Sometimes, often for hereditary reasons, people don't develop certain teeth. You may not develop all of your third molars (wisdom teeth) too. It is also possible to have extra teeth, known as supernumerary teeth. CROWN - The crown is the top part of the tooth that you normally see when you look in the mouth. It is covered by an outer surface of hard tooth enamel. Enamel, dentin and pulp structures are found in the crown of a tooth. The shape of the crown determines the function of the tooth. For example, front teeth are sharp and chisel-shaped for cutting. The larger molars in the back have broader, flatter surfaces for grinding. ROOT - The root is the part of the tooth that is usually under the gum tissue and is embedded in bone. Usually each tooth has one, two or three roots. The root/s take up about two-thirds of the tooth and hold the tooth in place. Cementum, dentin and pulp structures are found in the root of a tooth. ENAMEL - The enamel is the outermost layer that covers the crown of the tooth. It is the hardest, most mineralized tissue in the mouth and is even harder than bone. CEMENTUM - The cementum is a thin, outermost layer that covers the root of the tooth. It is softer than tooth enamel. DENTIN - The dentin is the layer of tooth just under the enamel or cementum. If decay makes it's way through the hard enamel or cementum, it will attack the softer dentin. The dentin contains numerous little tubes or channels that lead directly to the nerve center of the tooth known as the pulp. PULP - The pulp is the soft tissue found in the center of all teeth. It is commonly referred to as the nerve of the tooth. The nerve tissue and blood vessels are found here. If the pulp of a tooth is infected or diseased, root canal (endodontic) therapy can be performed to clean out the diseased tissue and seal up the pulp chamber. What are the Different Types of Teeth and What are Their Jobs? Our Lorne Park Dental team will help restore and maintain your beautiful smile. We want you to show off your great 'Pearly White' teeth and for you to keep smiling! !